Located near Dong Chuong Lake and close to Trang An Scenic Landscape Complex – the Vietnam’s newest World Heritage Site in Ninh Binh Province. 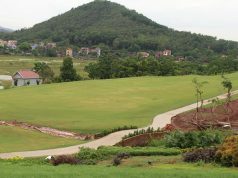 The course newly-opened course is about 100 km south of Hanoi. 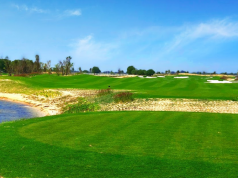 Trang An Golf & Country Club is an exclusive, 18-hole Members-Only course that stretches out from 5,345 yards of Red tees to 7,074 yards of pro tees and has a smaller 18-hole “precision” course where golfers can improve their short games. 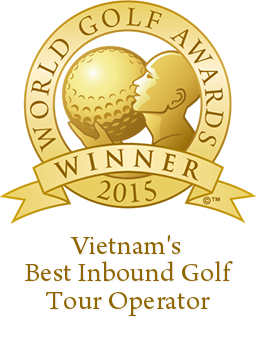 The 18 hole championship course covers an area of 60 hectares, which weaves around the mature pine forest with magnificent view of limestone karst peaks and is surrounded by 45-hectare Dong Chuong Lake that offer a peaceful & serene atmosphere for a golf trip of players from Ha Noi and other nearby provinces. This medium-length layout features 5 sets of teeboxes for the enjoyment of golfers, but with 96 bunkers (54 near greens and 42 along the fairway) scattered throughout the course makes it a real test for the most experienced players. Trang An course allows players to exploit their strengths and overcome their weaknesses on the basis of fair and open competition. 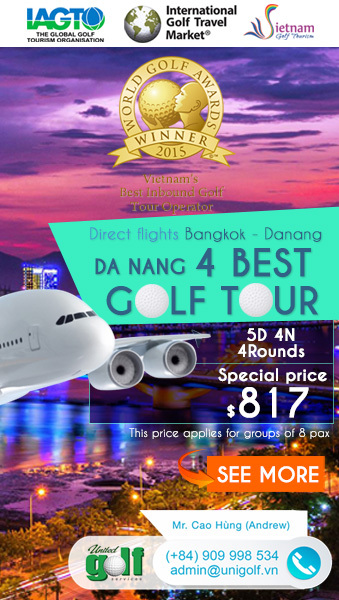 To serve many buzy businessman who have a passion for golf but don’t have enough time to try some new golf courses, Trang An Club coorparated with Hai Au Aviation – The Vietnam’s only seaplane services to open a 30-minute seaplane trip from Ha Noi to Trang An, the plane takes off from Ha Noi and land on a river near there, then visitors can take a 10-minute boat to access the golf course. 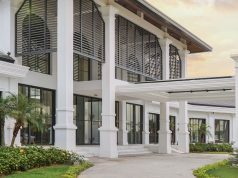 The Country Club services the Member’s Residential area and has a main clubhouse that includes both male and ladies locker rooms, each with a jacuzzi; fully staffed restaurant with a wine cellar; and outdoor patio; VIP locker rooms; VIP dining rooms and cigar area; a meeting room. It also boasts a smaller clubhouse with children’s play, educational area, two tennis courts and a swimming pool. There is also a Vietnamese wooden frame house available for those wishing to hold traditional weddings. Address: Ky Phu Commune, Nho Quan district, Ninh Binh province.